Mix flour, sugar, soda, baking powder and salt. Combine buttermilk, oil and eggs. Add to dry ingredients and beat for 2 minutes. Add mashed bananas mixed with vanilla. 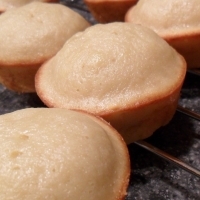 Pour into greased muffin pans or 9X13 cake pan. Bake at 350 degrees for about 25 minutes. Use toothpick test.